YO Linda -- Sire: YO Sam Houston. Dam: WR 1446. She was registered as 1/4 Peeler and 3/4 WR blood. 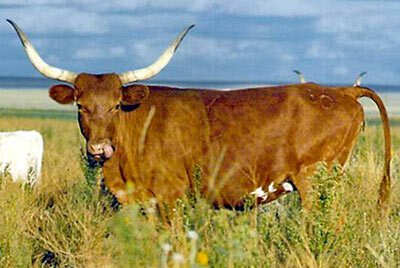 In 1967 my search for the better Texas Longhorn cattle started. There were a lot of variations in the early herds. Most cattle were some shade of red. Most cattle had fairly high and small horns with most cows 25 to 32" T2T. Most were long headed, deep chested, short backed and slender torpedo rear ends. Some had nasty dispositions. The average cow weighed 600 to 800 lbs and bulls were 800 to 1100 lbs. Commercial cattlemen had absolutely no appreciation for the TL breed. That was our starting point. Over the next 12 years I set a life time goal to see all the known TL herds. That included Wichita Refuge, Wrights, Travis Marks, Chopique, Scott, Archer, King Ranch, Blevins, Isaacs, Raiser, Niobrara, YO Ranch, Phillips, Holman, WW Collins and Lely. The Milby Butler herd had dispersed, as had the Cap Yates. Those cattle were scattered all over. Graves Peeler had died and most of his cattle went to Jack Phillips and Walter Scott. Beyond that, there were small herds randomly located. One of the good small herds was owned by Edwin Dow, with a ranch in Bosque County Texas. Edwin was an early TLBAA VP. Edwin and I worked on fund raising to buy the property for a TLBAA office/museum on North Main. For a certain period the frontage property could be bought for $62,000. With Edwin's courage and determination, he approached the Amon Carter Foundation in Fort Worth with the idea of locating the TLBAA headquarters in the Stock Yards area. With Edwin's constant persistence (his other job was selling life insurance) the Amon Carter Foundation finally forked over the $62,000. That was an exciting day! The land was bought. This was no doubt the best business decision in TLBAA history. When visiting TL herds I asked if I could pick out some cows. Without exception, in the early days, the owner would agree and say, "I hope you find some you like." The prices were mostly $250 to later on, $400 for pairs. There wasn't a line of buyers waiting at the ranch front gate. In a herd of 50 or so, I normally could afford a half dozen pair at a time -- I worked to select the best body, color, and flat wide horn cattle. Edwin had made an effort of buying a cow here and there and picking the top cows wherever he found them. He was very proud of YO Linda, who Edwin thought was the largest horned cow in the breed. I went to Bosque Co and finally made a deal to buy 3 cows from Edwin and he delivered them to Colorado. He was hard to deal with on YO Linda, but he had kept her son for a herd sire and did not like her being bred to her son. I got a twisty horned dun WR cow, Dow's Snow Fawn and YO Linda. He wanted $300 each and for $100 he delivered. Gas was only 30 cents a gallon then. Edwin showed up a few days later driving a large Cadillac with a bumper type trailer. His car just cleared the ground in the back an inch or so and the front end pointed up in the air. It was exciting to see them come off his trailer. Edwin was a lover of the breed his whole life and a great human. YO Linda gave us Texas Lin by Texas Ranger and Lone Ranger 55. She also gave us Mr. Lin the sire of PLR Miss Lin who sold in the Larry Smith Jr dispersal for $40,000 many years later. Charlie Schreiner III came to see our herd when we got up to about 70 cows. He said he would give $1000 each to pick out 3 cows. At first Charlie would not tell me which 3, then he said Measles, Ghost and YO Linda. At that time this would have proved some things with my critics, but, as I have found many times, a great business virtue is to be able to resist the highest offer. My Dad, Frank, who was not often a fan of Texas Longhorns, said to sell all 3, as I would never get a better offer. I had 5 calves out of YO Linda so I let him only have YO Linda. That was the highest selling cow we had heard of at that time, about 1977. YO Linda was the pick of the early YO Ranch genetics. In the late seventies she contributed a forward jump in horn growth to the breed's foundation blood. Texas Lin sired Royal Mounty, who sired King. Lone Ranger 55 sired CT Commander who is in the pedigree of Starlight. Mr. Lin is the thick muscle contributor to the King's Lynn, then Overlyn multiple successes for Burton/Stockton. YO Linda was the start of an increased horn genetic factor that has strengthened foundation pedigrees of Peacemaker, Cherry Jubilee, Rio Catchit, Over Kill, Royal Spice, Cowboy Tuff Chex, Maximus, Sweet Brindle Dust, Clear Win, 50-50, Rio Grande, Drag Iron, Rodeo Max, Super Bowl, Starlight, Tempter, Cowboy Casanova, Jamakizm, Shadow Jubilee, and Becca.